Getting a merchant account in Hong Kong, or anywhere in Asia for that matter, is a massive headache! 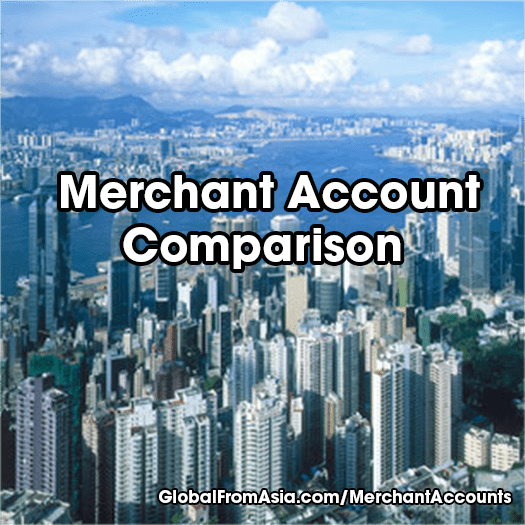 Here at Global From Asia, we are working hard to keep an up to date list of providers who offer merchant accounts for Hong Kong based companies. We hope to make it easier for us “offshore” and “high risk” companies to do international business just like everyone else in the world. If you have additions or edits to be made to this list, please contact us! Interested in getting matched up? Learn more here. You may instead choose to keep a merchant account in USA or Europe. We have a Remittance Partner Recommendation for you today. Aurelia Pay is a leading cross border payment service in South East Asia, Hong Kong and Greater China. With our independent end to end payment network, Aurelia Pay delivers payment within the same business day with competitive, fair and transparent FX rate. Check out Aureliapay today! Can a Hong Kong business be eligible for this merchant account? YES. What is the monthly fee? & What is the processing / transaction fee? How long does the application take? Normally it takes about 5-10 working days for an application to be approved, depending on the business nature and background, provided that the applicant has provided all necessary information and documents. Asiapay was founded in 2000 and is headquartered in Hongkong. It offers various services such as payment processing and payment gateway solution in 13 countries. Asiapay is a leading electronic payment platform in Asia, in fact, recently, it has been included in Financial Times’ 1000 high-growth companies in Asia Pacific. What is the account opening fee? NOT POSTED ON WEBSITE. What is the monthly fee? AND What is the processing / transaction fee? Guarantee Service Charge (GSC) (only if applicable). Note that the WorldPay Guarantee is only available in the UK. Funds Transmission Charge (FTC) – a transfer fee that is applicable where there is a transfer of funds to a bank account. any Value Added Tax (VAT) or Goods and Sales Tax (GST) if applicable – this rate may vary, depending on the region in which you trade. Weekly invoices can be accessed from the Reports menu on the Merchant Interface. Each month you will receive a Monthly invoice for each of your accounts. Monthly charges will be deducted from your first weekly Transfer payment in the month. Value Added Tax (VAT) or Goods and Sales Tax (GST) if applicable. Monthly invoices can also be accessed from the Reports menu on the Merchant Interface. Has this business been mentioned on Global From Asia? Worldpay was formerly known as RBS Wordlpay (Royal Bank of Scotland Group). It has been a pioneer in card payments, gateway services, and cross-border payments. It operates globally in over 146 countries and dominates the market in the United Kingdom. Among its features are: customizable fraud management tools, seamless cross-border payments and innovative gateway services. How long does the application take? You can use your debit card, credit card, or your bank account to verify your PayPal account. When your account is verified, the sending limit and withdrawal limit on your PayPal account will be lifted. – Log in to your PayPal account. – Click Get Verified below your name. – Follow the steps to become verified. Paypal was founded in December 1998 and is one of the oldest and finest online financial service providers. With over 2 decades of experience, Paypal has been the most trusted brand by many Americans when it comes to payment processing. Paypal supports more than 100 currencies and over 227 million users are actively using Paypal to connect and transact in new and powerful ways, whether they are online, on a mobile device, in an app, or in person. What is the company name? Global Payments Inc.
GlobalPayments is a leading payment technology expert that brings expertise and global perspective to commerce. For over 50 years, Global Payments has been delivering various payment solutions to over 30 countries. It is one of America’s largest payment processor, supports over 140 currencies, and serves over 2.5 million merchants globally. A Singapore-based payment technology and merchant service company that was founded in 2005. MC Payment was one of the first omni-channel payment providers in Southeast Asia and Oceania and was actually the first MasterCard certified gateway in Asia for Level 3 enhanced data processing. It offers merchants various services such as payment platform, sending of electronic invoices, B2B payment and many other. How long does the application take? Normally, it takes approximately three weeks to process an application. EPS or Electronic Payment Services is an electronic payment system that was founded and established in1984 in Hongkong. EPS is currently a consortium of 20 major banks in Hong Kong, it processes over HK$500 million daily, and is available in over 30,000 acceptance locations in Hong Kong, Macau and Shenzhen. IPS was founded in 2004 and was a pioneer in payment processing companies in Hongkong. It offers various solutions for merchants such as cross-border online transactions, clear backend solution, ecommerce payment platform, and an anti-fraud system. FDMS operates in 34 countries and supports over 6 million merchants globally. It offers merchants secure and value-added solutions such as online payment gateway, straightforward payment processing solutions, currency conversion and batch authorisation. MIGS is an on-site payment method that provides fast and secure processing of payment with debit/credit card. It is one of the most popular payment gateways in the world – in fact, Mastercard was the world’s fastest payments processing network. Usually, banks offer MIGS to their merchant account holder. What is the company name?Vindicia, Inc.
Can a Hong Kong business be eligible for this merchant account? Special Notes? They focus on subscription revenue model businesses exclusively. Has Vinidia been mentioned in Global From Asia? Yes, we had Paymentwall on the podcast here. Vindicia has been in the industry for over 15 years, providing comprehensive payment solutions. Its subscription business model accommodates virtually every type of service and product imaginable. It accepts multiple payment methods, including credit cards, debit cards, ACH, Amazon Payments, Apple Pay, PayPal, ELV, direct debits, mobile payments, and many other popular regional methods. One of Vindicia’s best features is its fully customizable subscription billing and payment platform that can benefit any merchant. Paymentwall is a San Francisco-based company that was established in April 2010. It’s one of the best global payment platforms, in fact, over 200,000 merchants use this service, including business giants like SEGA, LG Electronics, Bandai Namco, Shopify, Kakao Games and more. Paymentwall accepts credit cards, and 150 more local payment methods to make sure customers will easily find a way to pay. What is the company name? 2checkout. As a result of changing rules and regulations in the payment industry, we are no longer able to maintain Sellers in your geographic region. 200+ global markets, 15 languages, 87 currencies, 8 payment types. 50,000+ merchants,18 years of experience. These numbers simply tell why 2checkout is one of the leading global payment platforms in the world. It accepts online and mobile payments from buyers worldwide, with localized payment options. It has flexible integration, advances fraud protection and large global reach. What is the company name? Stripe Inc.
Stripe is another San Francisco-based popular payment platform that accepts payments online and in mobile apps. Today, it supports over 100,000 merchants from 100+ countries and across nearly every industry. It offers 3 main services: Payments, Subscription and Stripe Connect. Other notes? Been told they hold the money longer than Paypal. Skrill is a London-based company that offers global payment solutions since 2001. It offers various services such as E-wallet, Money Transfer, Online Payment, Forex and many other. Can a Hong Kong business be eligible for this merchant account? Not confirmed, but told yes. FastSpring is a California-based digital commerce platform founded in 2005. It accepts more than a dozen currencies, supports over 20 languages, accepts all major credit cards, Paypal, bank transfers, checks and more. Fastspring paltform is designed from the ground up to support a full spectrum of digital products and distribution models. mPay is a Hongkong-based multi-channel Online Payment service founded in 2005 that provides multi-delivery channels, supports many currencies, and facilitates merchants with our value-added services such as shopping cart content management system and SMS Alerts. Can a Hong Kong business be eligible for this service? Well, it’s not a merchant account, it is letting people send money abroad at the lowest possible true cost. Using only real exchange rates and tiny not-hidden-fees. Headaches averted, and a revolution sparked. Has Transferwise been mentioned in Global From Asia? Yes, we wrote a review on Transferwise here. Transferwise is a popular cross-border payment provider. As its tagline says, Money without borders Transferwise makes sending money abroad less expensive, letting people send money abroad at the lowest possible true cost. For merchants that have customers from abroad, Transferwise can be a good option to get paid for its real exchange rates and tiny not-hidden-fees. Can a Hong Kong business be eligible for this service? in Hong Kong since April 2015!. What is the account opening fee? None, but a couple weeks of verification. How long does the application take? From what I’ve heard 2 weeks is fast, 1 month more reasonable. Braintree is a Paypal-affiliated company that was founded in 2007. It specializes on global commerce tools such as merchant accounts and payment gateway services. Its seamless and simple integration is so user friendly that numerous merchants in more than 40 countries utilize their payment platform. Today, it accepts and processes over 140 currencies and offers almost any way to pay such as credit/debit, Paypal, Venmo, Apple Pay, Google Pay, Visa Checkout, Masterpass, Amex and ACH direct debit. Can a Hong Kong business be eligible for this service? in Hong Kong!. What is the account opening fee? Need to find out. What is the processing / transaction fee? Not on site. How long does the application take? Need to find out. Has Payoneer been mentioned in Global From Asia? Yes, have a podcast here mentioning Payoneer for use with Amazon USA sales. Payoneer is an international financial service company that offers various products and services such as e-wallet, secured payment platform, billing service, and many more. It was founded in 2005 and based in New York. Today, it operates in over 200 countries, has over 4 million users and supports 35+ languages. Can a Hong Kong business be eligible for this service? yes,in Hong Kong! Has eWAY been mentioned in Global From Asia? Not yet, interested to interview them! Eway is a global all in one secured payment platform allowing businesses to accept secured credit card payments from customers around the world. Eway has been in the business for over 18 years and dominates the market in Australia. Its best features include seamless integration, fast settlement, robust fraud prevention toolkit and client side encryption that minimises cart abandonment. Eway is perfect for e-commerce site that has large number of customers from Australia. I hate to pick favorites – but Braintree and Stripe are really winning in the Hong Kong market I would say. They are best for e-commerce companies that want to integrate with shopping carts and custom websites seamlessly. So that is all we got! Did we miss any merchant accounts? While we focus on Hong Kong and Asia, seems we are covering them from around the globe so please comment below with ones we may have missed! Great article! I would also mention Payoneer (http://www.payoneer.com) that I use to receive payments from US companies that can’t pay you otherwise, like Amazon affiliates. Stripe Now in Singapore! Hong Kong Next?